Breton horses come from France but can be seen along the British side of the English Channel and most often in the land of Rennes. Primarily they are raised for light or heavy drafting. They are sweet, easy to maintain, and full of energy. They can be extremely handy on farmlands and are very loyal to their owners as well. They were one of the first types of horses considered to be mountain animals. In the Middle Ages they were bred into two various breeds. One was considered a heavier style noted as the Sommier, and the other was the Rossier, which was a lighter horse style created just for the primary use of riding. During the nineteen hundreds, the breeders began to make ones that were bigger, stronger, and utilized as work horses. They were created by including the blood lines of the Boulonnais and Percheron styles. They can be seen doing draft work and pulling plows. They went on to be crossed with the Norfolk Trotter lines, which in turn created the Postier horse. 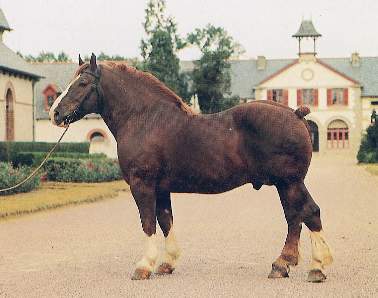 There are currently still two various styles of the Breton horses called the Heavy Draft and the smaller version, the Postier. They stand at around sixteen hands. They can be found in chestnut, bay, roan, gray, and have details such as a flaxen mane. Their heads are short and neat looking with a sloping croup and hard feet. They also have muscular shoulders and have a wide and short back ideal for pulling and carrying heavy loads for their owners. They are a simple horse to tend to that can gather their own food when needed and can even find shelter. No major health issues have been reported on them and they are relatively inexpensive to maintain as well. They can do well in any climate, warm or cold.